Based on the History's series Six, an action-packed military thriller following the elite, legendary SEAL Team Six.The elite Navy unit known as SEAL Team Six is made up of some of the most renown and fearsome warriors of all time, deployed for only the toughest missions in the most dangerous places on Earth. Richard “Rip” Taggart used to lead this unit, until after seeing and experiencing too much on the battlefield he snaps and executes an American in cold blood in Afghanistan. 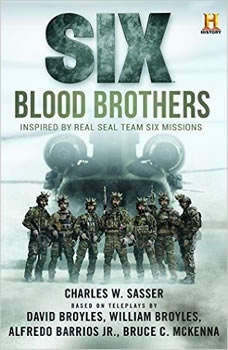 Now, two years later, he has been exiled from his brothers in Six and works for a private security group in Nigeria until he finds himself in the wrong place at the wrong time and is captured by Boko Haram along with a group of Nigerian school girls.But the brotherhood of the SEALS runs deep. Once Rip’s unit finds out that he has been taken, they demand to be the ones to bring him back home. But as they mount their rescue operations, they find themselves squaring off against an enigmatic lieutenant of a rising terrorist group, someone who seems to have a particular interest in getting to Rip first.Based off the gripping new series from creators David Broyles, Special Operations veteran, and William Broyles, and inspired by the true stories and events involving SEAL Team Six, Six: Blood Brothers will give readers a visceral taste of what it means to be part of this squad, balancing their own personal demons and complications of family life with the need to serve their country and be there for their brothers-in-arms.